A newly released ATLAS search studies approximately 30 million collision events that produce two high-energy sprays of particles in the final state. These sprays are known as “jets” or, when seen in pairs as in this case, “dijets” (Figure 1). 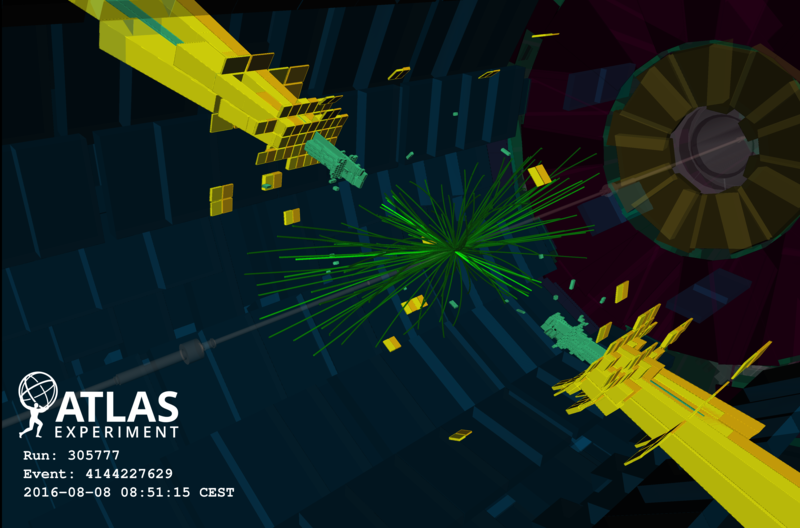 Jets with extraordinarily high energies – copiously produced due to the strong interactions of quarks and gluons – probe the highest energy scales of all processes at the LHC. These jets can provide a window into new physics phenomena, and allow ATLAS physicists to search for mediators between Standard Model and dark matter particles or other hypothetical objects such as non-elementary quarks, heavy “partners” of known Standard Model particles or miniature quantum black-holes (a phenomenon of strong gravity predicted in models with additional spatial dimensions). They can even be used to search for very heavy particles with masses beyond the LHC collision energies, through models known as contact interactions (similar to the Fermi model for weak interactions). The dijet search described here consists of two complementary analyses: the resonance analysis and the angular analysis. The resonance analysis looks for a localized excess in the dijet mass spectrum. In the absence of a heavy resonance, the mass distribution is well described by a smooth, monotonically falling function. A statistically significant bump would signify a new particle with mass near the measured bump. The histogram in Figure 2 displays the results of the resonance analysis. The x-axis represents the dijet mass (mjj) and the y-axis (shown with a logarithmic scale) represents the number of observed events. The solid black dots show the data, the red curve represents the fit of a smooth function to the data, and the open green dots show how two non-elementary (“excited”) quark signals might look like. The second panel shows how significant the deviations in the data are as compared to the smooth background fit. The vertical blue lines show the region with the largest significance. A statistical analysis results in a probablility value of 0.63 which means that there is no significant deviation from the Standard Model. The third panel compares the data to the dijet mass prediction; again, no significant deviation from the Standard Model expectation is seen. Jets can provide a window into new physics phenomena, and allow ATLAS physicists to search for mediators between Standard Model and dark matter particles or other hypothetical objects. The angular analysis compares data to Standard Model predictions, looking for shape differences in a variable called χ. This variable measures, in the dijet rest frame, the production angle of the jets with respect to the beam axis. It is sensitive to the fact that new physics signals are expected to occur relatively larger in the central part of the detector. Figure 3 shows this comparison made in seven different dijet mass regions with the x-axis representing χ. As the deviations are mass dependant, comparing χ in different mass regions enhances the sensitivity to new physics. The y-axis gives the number of observed events per unit of χ. The solid black circles show the data, the solid black line represents the Standard Model prediction, and the green and blue bands show the theoretical uncertainties. The dotted red and yellow lines show predictions using two contact interaction theoretical models. No significant deviations from the Standard Model are seen in the angular analysis. These results are used to set exclusion limits on the frequency of some of the aforementioned potential signals from new physics. Exclusion limits play an important role; they constrain new physics scenarios and offer guidance towards developing realistic models that move us closer to answering some of the greatest mysteries in physics. Presentation at Moriond Electroweak Conference by Yanyan Gao: "Search for dijet resonances at high mass and other hadronic final states w/o MET with 13 TeV data"